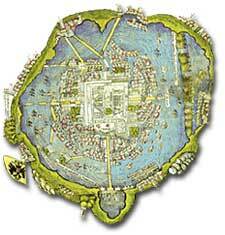 The capital city of the Aztecs, Tenochtitlán, was an engineering masterpiece. Aqueducts and canals snaked through the city, channelling pure water to possibly 200,000 inhabitants each day. In 1978, while digging in the basement of a bookstore, workers for Mexico City's power company hit a huge stone disk. Almost 11 feet across, engraved on its surface was the dismembered body of Coyolxauhqui, the Aztec moon goddess. In the center lay her torso, naked but for a belt of snakes. Around the edges were scattered her severed arms, legs and head. She had been slain and cut to pieces by her brother Huitzilopochtl moments after his birth. 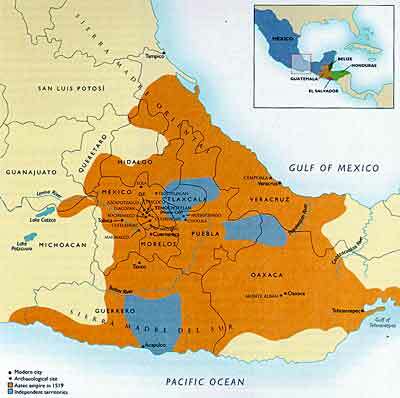 The Aztec empire of 1519, shown in orange, ruled over vast expanses of central Mexico. The Aztecs dominated the Valley of Mexico for 100 years, until their downfall at the hands of Hernan Cortez and his conquistadors in 1521. They built their capital in the most unlikely of places — the center of a lake. Tenochtitlan was a city surrounded by water, with temples and pyramids — sparkling white monuments and ceremonial squares gleaming in the tropical sun. It sat in Lake Texcoco, criss-crossed by canals and connected by three broad causeways to the shore. Along the lake edge the Aztec created chinampas, or raised fields of rotting vegetation and lake-mud. Extraordinarily fertile, they yielded many crops per year. One story central to the Aztec belief system was the tale of their origins. Aztecs believed that one day while doing housework, the ancient Earth goddess Coatlicue (Serpent Skirt) was impregnated by a ball of feathers. Coyolxauhqui and the 400 stars of the southern sky, her children of the night, grew jealous and determined to kill her. They sliced off her head. Her unborn child, Huitzilopochtl, learned of the plot. He leapt from her body fully grown. In his hand he brandished a club lined with slivers of razor-sharp black volcanic glass called obsidian. He chopped up Coyolxauhqui and her brothers — a metaphor for the way the sun overwhelms the moon and stars when it rises at dawn each morning. Huitzilopochtl commanded the Aztecs to travel south until they found a cactus with an eagle nesting in its branches. After many adventures and much misery, they discovered an island with a prickly pear cactus in the year 1 Flint (1324 AD). Sitting upon it was an eagle with outstretched wings and a snake held tightly in its talons. This became the site of Tenochtitlan, now Mexico City. The Aztecs believed the oval red fruit of the cactus symblolized the human heart. Today an eagle, cactus, and snake are the national emblems of the Republic of Mexico. Within 50 years of founding Tenochtitlan, the Aztec had extended their rule all across the valley. They formed political alliances with other states, skillfully intermarried with their nobles, and fought tenaciously in battle. Their empire was created by a culture of war. Boys were taught from an early age to be warriors. A warrior who captured four or more prisoners could become a Jaguar or Eagle Knight, and wear brightly colored body-suits of feathers. Girls were prepared for the battle of childbirth. Women who died in labor became goddesses, accompanying the sun across the sky each day from noon until sunset. created, produced by Katherine Guardado and David Shindle. Quetzalcoatl was the most influential god of the Aztec religion. Called the "Feathered Serpent of Ancient Mexico," he was claimed to have invented fire and discovered maize, the staple food of the Aztec people. By 1519, the Aztec cycle of conquest and exploitation was at its peak. More and more conquered peoples provided tribute, the basis of the Aztecs' immense wealth. More and more prisoners were captured for human sacrifice. Conquistadors were astonished by Aztec marketplaces. They found dealers in gold, silver and precious stones. They saw embroidered clothing and cotton goods and cacao beans for chocolate drinks. Jaguar pelts and deerskins, as well as the brilliant blue plumes of the cotinga bird lined the marketplace. Food included vegetables and fruits, turkeys, young dogs, wild game and many kinds of honey. There were sellers of tobacco, liquid amber, and herbs. All this and more poured into Tenochtitlan. At the same time, the conquistadors heard tales of the day 20,000 captives, some roped together through their noses, wound through the streets to be sacrificed at the top of the Great Temple steps. Within two years, the Aztec culture was destroyed by the Spanish. Tenochtitlan lay in ruins. There would be no more human sacrifices. And, as the Aztec feared, without life-sustaining blood their gods deserted them and darkness descended on their cosmos. From the 13th to the 16th century, the warlike Aztec people inhabited the lands surrounding Tenochtitlán (present-day Mexico City) in the central Mexican basin. By the time of Cortés' arrival, the Aztecs had created a great empire. Get the facts on the Aztecs, and use the links to explore this astounding civilization. In this truly comprehensive website, learn about the Aztec Empire from their capital of Tenochtitlán to their fall at the hands of the conquistadors. The time between the Spanish landfall on the Mexican coast April 22, 1519, and the surrender of Tenochtitlán on August 13, 1521 makes a fantastic story. This page is a long read, but it is well-organized with three great images. Many Westerners think of the Aztec god Quetzalcoatl as that "feathered serpent of Ancient Mexico" who is supposed to come from the East to take back his power. 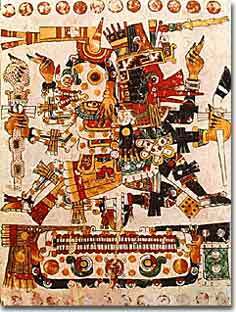 To the Aztecs however, Quetzalcoatl plays a huge role in their religious and cultural beliefs. The numerous links at this university website provide more info on the many aspects of his legend. View maps of pre-Columbian Mexico from 20,000 B.C.E. right up to the surrender of the Aztec capital city of Tenochtitlán in 1521 C.E. Find out where the Aztecs came from, their religious beliefs, architecture, politics, way of life, and much, much more. Entertaining pictures and a chance to write your own Aztec myths will keep you interested. But the best part of the website is the engaging, student-appropriate writing. The rise and fall of Mesoamerican culture is the subject of these pages created by the Mexican Department of Education. Excellent writing and images breath life into the history of Mesoamerica, from the beginning of agricultural settlements to the decline of the empires at the hands of European conquerors. The last major force on the scene, the Aztecs, did not arrive from the north until the year 1300. They built the largest Empire though, covering huge portions of Mexico. Visit an online museum devoted to Aztec archaeology. Divided into eight halls, the Templo Mayor Museum preserves and displays the finds from digs at Tenochtitlán. Learn about how the finds provide knowledge about the religion, rituals, trade, and agriculture of the Aztecs. How do archaeologists know that Aztec traders traveled all the way to Panama or that farmers worshipped the god Tlaloc, "He Who Makes Things Grow?" 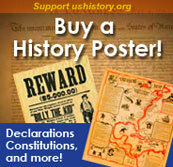 Find out for yourself the amazing information that is learned from an archaeological dig.